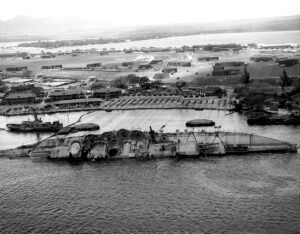 USS Oklahoma, capsized in front of USS Maryland. With twelve torpedo launched against her, USS Oklahoma took the brunt of the torpedo attack on Pearl Harbor. Nine of those torpedoes hit their mark. The torpedo attack ripped open holes in the Oklahoma’s hull and caused her to list 40 degrees. Eventually she turned turtle and rolled 135 degrees and 429 men lost their lives. The Oklahoma was a Nevada Class battleship. She was moored on battleship row with her sister ship Nevada. 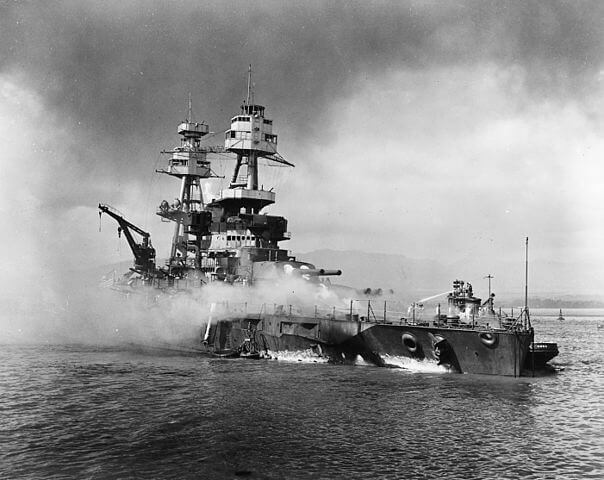 The Nevada class battleships were oil-fired instead of coal-fired like the USS Arizona. She was also smaller than the Arizona at 583 feet and 27,100 tons. Oklahoma was commissioned in 1916. It was her position as outboard ship that made her an easy target and allowed for so many torpedo hits. The Maryland was inboard of Oklahoma and as a result was shielded by torpedoes. The torpedo attack took only 11 minutes and the Oklahoma was capsized in 15 minutes. Torpedo strikes hit the USS Oklahoma and USS West Virginia. The USS Arizona has not yet been hit. Part of the reason that Oklahoma sank quickly was her anti-torpedo voids had their inspection covers removed. The following day, Monday, December 8th, an admiral’s inspection was scheduled. That compromised her watertight integrity. They could not even make attempts to counter-flood because of the speed with which she was flooding. After she listed to 40 degrees, it became clear to the ship’s executive officer, Commander Jesse L. Kenworthy that the ship was going to roll over. He ordered his men to abandon ship over the starboard side as it was rolling over. Like the men of the other ships abandoned, they had to swim through the dangerous, oily water to safety. Some men swam to nearby Maryland, others made it to Ford Island. Photo from December 7th, 1941. The USS Oklahoma is capsized. Many men were trapped when the Oklahoma capsized. They began banging S.O.S. against the bulkhead in hopes that they would be rescued. Their banging was heard and shipfitters from smaller vessels began cutting holes into the Oklahoma. The crew members stuck in the Oklahoma were surviving on the small amount of oxygen left in the compartments. Some died when the torches used to cut through used the last of their oxygen. The Oklahoma was righted in 1943. In 1944 she was decommissioned. It was determined that she would never return to service. In 1946 she was sold to a California company with plans to scrap her. As she was being towed to California in 1947, the ship encountered a serious storm. The Oklahoma began sinking and dragging the two tug boats with her. They cut the lines and let her go. She remains at the bottom of the Pacific Ocean today. Many of the Oklahoma‘s survivors were pleased to learn of her sinking. They did not want their beloved ship to be used as scrap metal. Finally, in 2007, a beautiful memorial was dedicated to the men of the Oklahoma. It is located near the entrance to the USS Missouri on Ford Island in the middle of Pearl Harbor. You can visit the memorial on all tours that visit the USS Missouri. Oklahoma Memorial with white pillars representing lost Marines and Sailors in pristine white dress uniform manning the rails.